For the 3 million people in America (myself included) with celiac disease — an autoimmune disorder triggered by the ingestion of gluten — culinary life is a series of intricate leaps, accommodations and back-steps. We peer at labels, know the difference between "gluten-free" and "certified-gluten free" and keep a dedicated set of dishes and pots at home to avoid contamination by flour dust, crumbs of bread, and bits of pasta indulged in by family members or roommates. Even so, there are regular mishaps — like the gluten free Cheerios that weren't, or the news this past February that Chobani had recalled almost 85,000 cases of Flip Key Lime Crumble yogurt because they contained gluten, even though the containers were labeled gluten free. But now, two worrying new studies suggest that accidental gluten exposure, even among celiacs following a gluten-free diet, may be far greater than we ever realized. A February study in the American Journal of Clinical Nutrition looked at gluten exposure detected by two new tests, one for urine and the other for stool. The tests detect peptides of gluten that make it through the digestive tract intact in all of us. (Nobody completely digests gluten, but most individuals don't have an adverse reaction to the undigested molecules). Amounts of daily gluten in a regular diet can soar as high as 7,500 mg on average for women, and 10,000 mg on average for men. For celiacs, the recommended limit for safe consumption of gluten is a mere 10 mg a day — any more than that tiny amount can trigger symptoms and if exposure is ongoing, intestinal damage. That's because in celiac disease, gluten triggers an autoimmune response that damages the intestinal lining and impairs absorption of nutrients. The study, which examined data on individuals from two different clinical programs, found the average amount of gluten consumed on a gluten-free diet was 244 mg (by stool analysis) or 363 mg (by urine analysis). "This study reflects what many celiacs experience in real life," explains analytical chemist Jennifer Sealey-Voyksner, one of the study's authors. "I was diagnosed with celiac in the early 2000s and even on a gluten-free diet, I was still getting sick. I began to actually analyze my own food using mass spectrometry techniques, and I found out that some of the gluten-free pastas I was eating, and even a body wash I was using, contained gluten." In another study last year, the urine test for gluten exposure found that an astonishing 45 percent of children and 48 percent of adults on a long-term gluten-free diet were nonetheless being exposed to measurable amounts of gluten. The results go a long way toward explaining the decades of reports showing that somewhere between 30 and 50 percent of patients with celiac disease and on a gluten-free diet still have damaged intestines that have not fully recovered — even in the absence of obvious symptoms. That raises their risk of numerous health problems including infertility, osteoporosis and bone fracture and even lymphoma. "This analysis rocked me to the core," says dietitian Tricia Thompson, who founded Gluten Free Watchdog, a site that offers education, gluten-free food testing, and sometimes wrangles with the FDA or corporations to press for stricter oversight. "If the gluten levels reported in this analysis are reasonably accurate and can be corroborated by additional studies," says Thompson, "this raises so many questions — such as, how good is our counseling of celiac sufferers, and how often are they being exposed through cross-contact?" Cross contact can start at the farm, where gluten-free crops might be grown adjacent to, or rotated with, gluten-containing crops. It can also occur anywhere down the line in processing, packaging and shipping. When Thompson reported the study on her Facebook page, which has over 17,000 followers, worried comments spooled out, ranging from concerns about airborne gluten from the bakery section of supermarkets, to cross contact from wheat-eating family members, to a report from one woman with a gluten-detection dog able to reportedly detect down to 1 part per million (the dog alerted her to gluten on her shopping cart). A lament from one person with celiac disease seemed to sum it up: "There is no safe place in this world for a celiac. It breaks my heart." If individuals with celiac disease want to know whether their diets are compliant, the bowel and urine tests are now available for home testing from a company called Glutenostics, without a prescription. It is recommended that a patient work with his or her doctor and a dietitian to interpret results and get subsequent counseling. The urine test, says Glutenostic's managing partner, organic chemist David Winternheimer, is probably not sensitive enough to detect inadvertent exposure to gluten. "You have to eat 500 mg of gluten, or about two bites of bread, for the urine test to be positive," says Winternheimer, "and most people on a gluten-free diet don't get that much." Instead, the urine test is recommended primarily for caregivers and parents who want to be sure their children are adhering to the diet, especially when away from home. The stool test, in contrast, requires only 50 mg of gluten (roughly the amount present in a dime-sized bundle of bread crumbs) and can measure intake accumulating over several days. The stool test is unlikely to catch a low-level, one-off cross contact event, but could be useful for detecting highly contaminated food or ongoing consumption of low levels of hidden gluten. "If you are concerned that you have been regularly exposed to cross contact from gluten over a period of days," says Thompson, "you may find the stool test useful." Winternheimer confirms: "Patients who are symptomatic and not sure if the cause is gluten, or patients whose blood work still tests positive for gluten exposure, may want to utilize this test." If the stool test is positive, an audit of possible sources of exposure is in order — from other household members to foods or medicines that may contain hidden sources of gluten. "A dietitian may choose to have patients keep detailed food records," says Thompson, "that can be used alongside the results of stool testing to help determine possible sources of exposure." 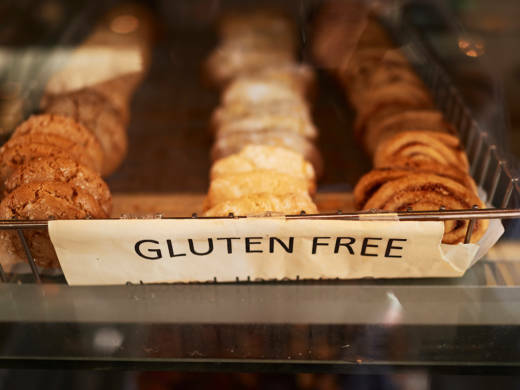 For Jennifer Sealey-Voyksner, these results point to the fact that a gluten-free diet may just be inadequate as a solitary treatment option for many individuals. "I just got 'glutened' yesterday at a restaurant," she says. When she ordered a sandwich on gluten-free bread at her regular deli, a new person in the kitchen mistakenly used regular bread. Several bites in, she started to experience symptoms – "brain fog and some cramps," as well as other gastrointestinal distress, she says, knocking her out of commission for another day. "I'm one of the more sensitive folks," she says. "It doesn't take very much gluten for me to show symptoms. There is a great need for more accurate tests to measure gluten in foods, as well as therapeutic drugs, either to work alone or in concert with a gluten-free diet."